A six figure capital investment by Glossop Cartons, including the purchase of the UK’s first Brausse Forza 900 C3 folder gluer, will help the company to energy-efficiently deliver cartons of the highest pharmaceutical standards and to further reduce customer lead times. 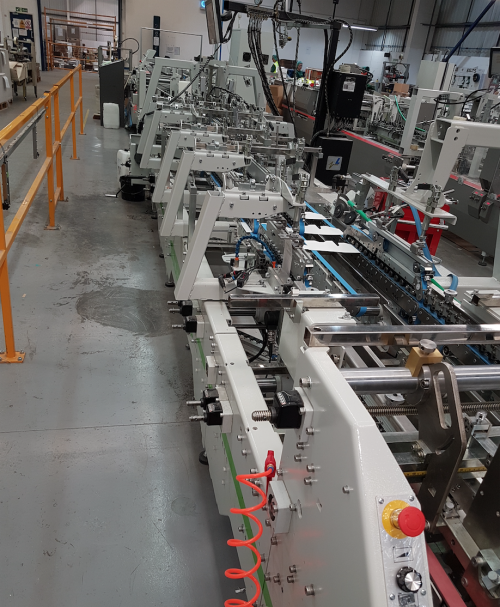 The 900 C3 acquisition by one of the UK’s leading manufacturers of carton board packaging is part of a wider investment in its gluing operation, which also includes the purchase of a Brausse Forza 1100 C3 folder gluer and new glue systems with the latest monitoring capabilities. The company’s investment in its gluing department will enhance its efficiency, enabling it to ensure that customers receive cartons finished to the highest pharmaceutical standards (ISO 14001 and OHSAS 18001) and will ensure competitive lead times. The new equipment is compatible with Glossop Cartons’ existing machinery, and features the latest technology in carton gluing. Simple to operate and fast-running, the machines are also quick to make-ready, enabling the team to progress swiftly from job to job. Energy-efficient and keeping carton waste to a minimum, the machines are helping the company to honour its commitment to improving its environmental sustainability. Glossop Cartons Director, Jacky Sidebottom-Every said: “The investment in our gluing department is the latest stage in Glossop Cartons’ continued investment programme, and will help us to continue to improve our carton offering, sustainably delivering both improved lead times and enhanced quality, which is what customers want in these extremely competitive times. Celebrating its 35th anniversary in 2017, Glossop Cartons is a family firm based in Stockport. Its core market sectors include pharmaceutical and beauty, food and drink, vapes and household. Customers include many blue-chip companies. Its product range comprises cartons, sleeves, wallets, blister pack cards, skin pack cards, countertop and shelf displays, header and hanging cards.